Hardy Begonia growing among Creeping Jenny, ferns, and ivy. Many years ago I heard about a hardy Begonia- a perennial Begonia which would spread to form a large mound of beautiful foliage and delicate pink flowers every single year. I looked for such a plant at nurseries for several years before finally finding a small pot one day at the McDonald Garden Center in Virginia Beach. I was so excited to finally have one to try in my own garden. Hardy Begonia was one of those legendary plants to me in those days- wonderful plants you hear about, but can rarely find for sale. You had to “know someone” who would give you a start of this quintessential “pass along plant”. This of course was before the days when we lived through the internet. I was on the mailing list for more than a half dozen nursery catalogs, but didn’t see hardy Begonia offered from any of them. Finally, I planted my start, among some ferns, in a moist and shady bed beside the screened back porch of my home in suburban Virginia Beach. What a treat to find it poking up underneath the winter litter of leaves each spring. This plant not only spread each year underground, it also produces a small “bulb” at each leaf joint towards the end of summer. Each of these tiny “bulbs” can sprout into a new plant. 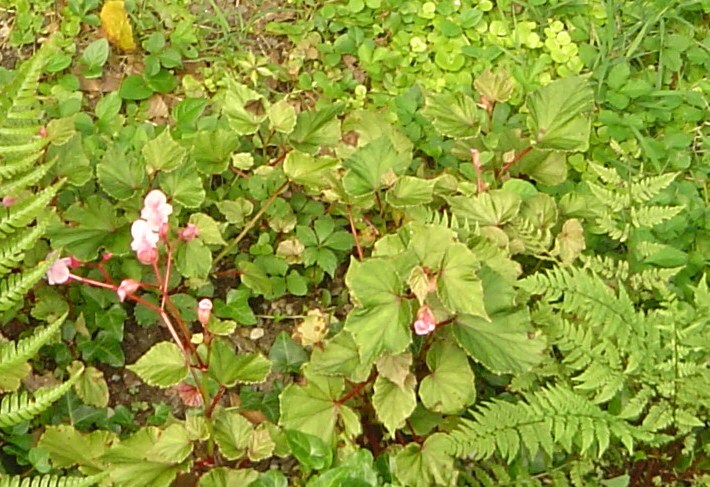 These tend to get scattered about, and so hardy Begonia, after a season or two, begins to pop up in unexpected spots near the original patch. These plants generally grow to about 2′ tall when growing in a moist, shaded area where they aren’t competing with many other plants. They show up fairly late in the spring, but once up, grow quickly. I would often find new plants popping up in nearby beds and between the cracks of a brick walkway. These shallow rooted plants can be easily moved to a spot where they can be allowed to grow. 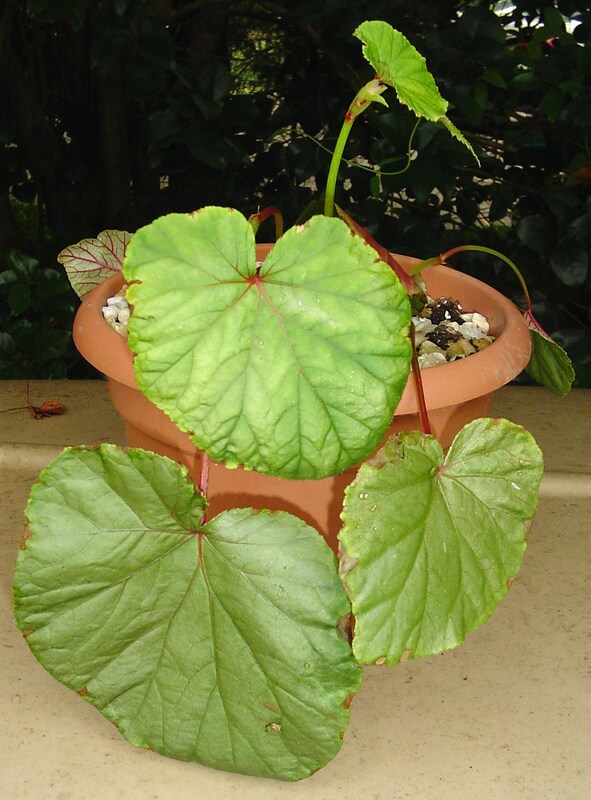 Hardy Begonia, Begonia grandis, has a delicate, medium green leaf, often with red veins. 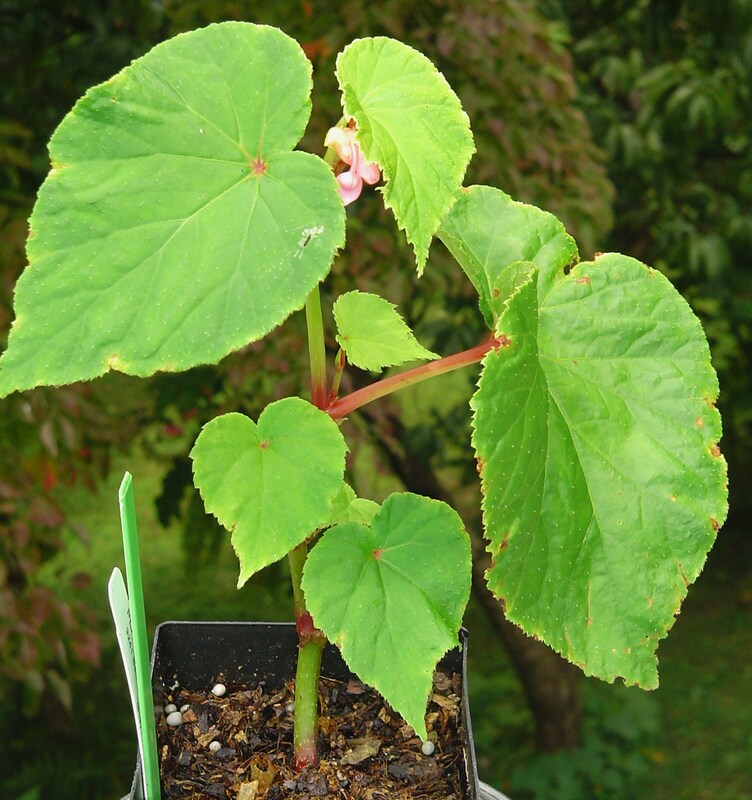 Though more delicate than most cane Begonia leaves, the Begonia grandis has a fairly large, elongated heart shaped leaf. This tuberous begonia still grows tall canes just like a cane Begonia. Its flowers range from various shades of pink to white, and are usually found growing in a large graceful panicle of flowers, much like cane Begonia flowers. The entire plant dies back to the ground with a heavy frost, but will grow again the following spring, usually larger than the previous year. I dug and potted several pieces of my beautiful hardy Begonia before selling the Virginia Beach house and garden, and transplanted them that autumn into the Williamsburg forest garden. Of course, I hadn’t realized yet how difficult the soil and conditions are here. I was also unsure whether or not the Begonia would come back well here, since we’re a zone cooler. Most hardy Begonias, it turns out, are hardy north to Zone 7b, though there are one or two varieties hardy to Zone 5. 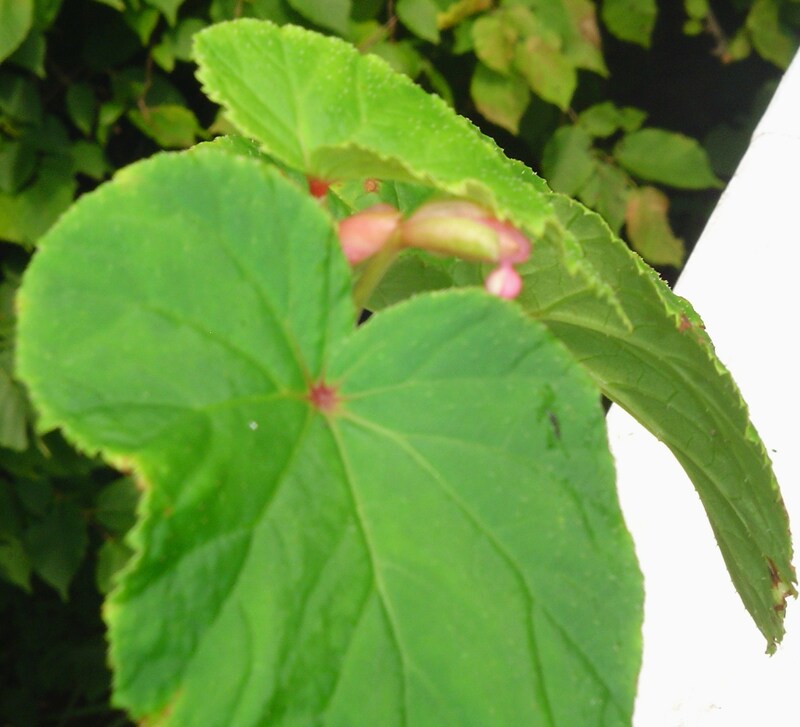 What a wonderful day when I found the first leaves of the Begonia the following spring. 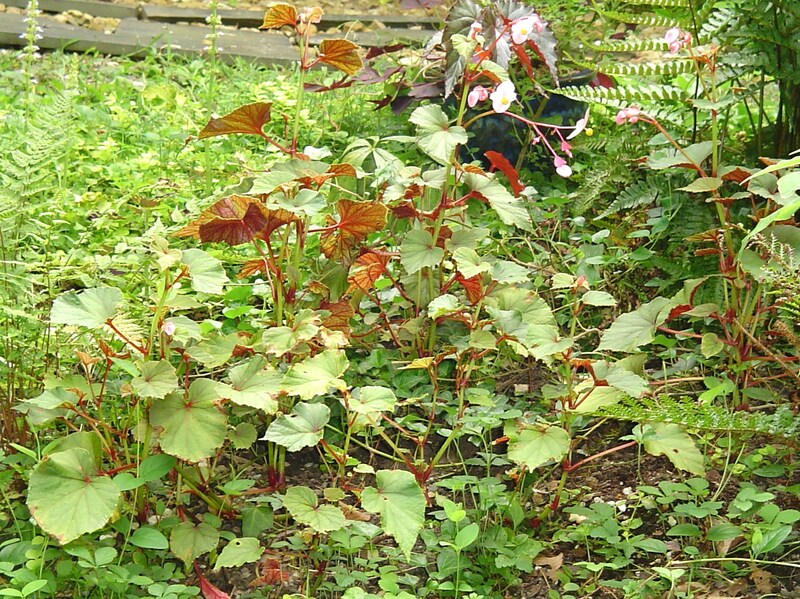 I had grown accustomed to the very large, healthy patch of Begonia which had taken hold over the years. It was reliably 2′ tall and nearly filled the bed by the time I moved. It bloomed from late June through frost, a dependable and hardy perennial, fed only with a topdressing of compost in early spring. This little bit I moved has struggled in its new spot on a hillside. There were no “beds” in the shade when we moved into this garden in the midst of a drought in early August. The little starts lingered in pots for weeks, and then I put them into the most protected shade area I could, where I planned to later develop a shade garden. They spread a little more each year. They haven’t yet achieved their lush 2′ potential, but they are blooming this year. Finally, this spring, I found hardy Begonia online at Plant Delights Nursery near Durham, NC. They carry six different varieties of hardy Begonia, including the new Begonia heracleifolia ‘Nigricans’ , or “Hogweed-leaf Begonia. Only four of the varieties bloom. I finally settled on “Heron’s Pirouette”, a Begonia grandis with especially large, deep pink flowers. It arrived last week in beautiful condition. My plan is to prepare a good, raised bed for this, divisions of the Begonia I moved, and also a Begonia good friends gave me this week. It seems they had some hardy Begonia growing in a pot on their deck last summer. It overwintered in the pot and came back strong this year. Suddenly, they realized that it was cropping up in an adjoining pot as well. As I was admiring it, they offered a cutting, which I couldn’t resist. That cutting became three pieces, dipped into rooting hormone, and set in a generous pot in the shade to take hold. I’ve already promised one of these cuttings to a friend who has none, and I’ll give her a division from my original hardy Begonia as well. This is such a wonderful “pass along plant’, passed between friends, moved between homes, linking one generation of gardeners to the next. Your article actually gave me chills as I read – it was so satisfying to hear the words that lived in my own heart about this dear plant. Just this past fall, I salvaged some from my deceased mother’s garden before the house is to be demolished by its purchaser. It was such a relief to see it coming up in many places – so late that I thought there was no hope! Now they are getting larger and I am ecstatic. A wonderful reminder of my mom. I will be sure to keep passing it on! I live in alexandria va and my neighbor planted a begonia that she had gotten from her grandmother along our fence. They LOVE my shaded yard and are coming up everywhere. Are they considered invasive? I love the pink flowers. Should I just let them go? Some might feel that is an embarrassment of riches 😊 I’ve never heard hardy Begonias called invasive , but they do multiply if they have the right conditions . You might find gardening friends happy to adopt any that you don’t want. They look spectacular in pots, and used as ‘shoes and socks’ plants with taller perennials . Their leaves are very pleasing to me even when they aren’t in bloom. My Mamaw has been growing these since she was a child, in the early 40’s. Last year she gave me several baby plants so I could grow my own. I’ve always had a thing for begonias , I was so excited to learn there was a hardy one. They’re happily growing in my shade garden, amongst the hellebores, ferns, anemone and of course bleeding heart. Hands down one of my favorite plants to grow. Same here ☺ Thank you for visiting . I love begonias! Such a beautiful flower…. What a wonderful begonia! I will look for one soon.